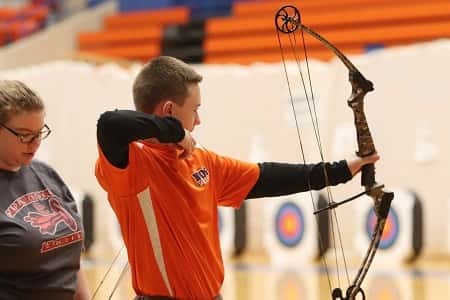 Marshall County Archery hosted the Marshall County Bulls Eye Blowout Saturday and came away with first place among seven high school teams competing in both Bulls Eye and 3D Challenge. 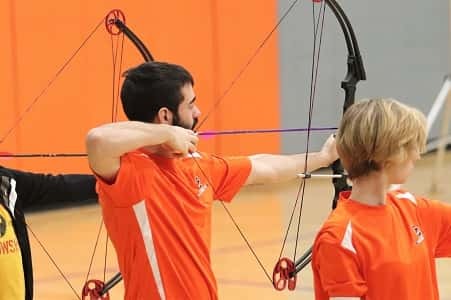 It was their eighth event of the season and of the seven they scored as a team, the Marshals have four first place finishes, one second, one third and one fourth with the Region 1 Tournament up next on Feb. 8 at Trigg County. 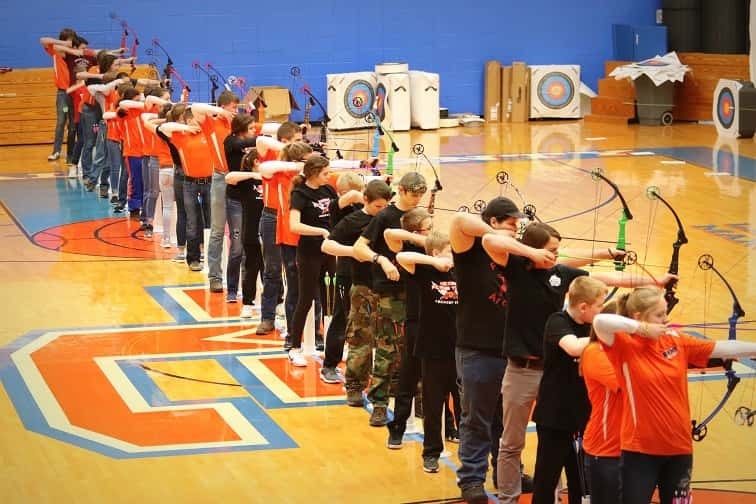 Marshall County placed second in the region behind Trigg County last season and went on to finish 43rd out of 106 in the Kentucky NASP State Championship. Jacob Miller took first in the Marshall County NASP/IBO 3D Challenge with a score of 277 and shooting 19 tens. Over 200 competed at Marshall County on Saturday. The archers shoot six rounds of five arrows with 300 being the maximum possible score. Senior Kendra Cannon led the way for Marshall County Saturday with a score of 292 (22 tens) to take 1st out of 67 girls. Senior Grace Boatright recorded the second best score for the team with 285 (16 tens) good for 3rd place overall for the girls. 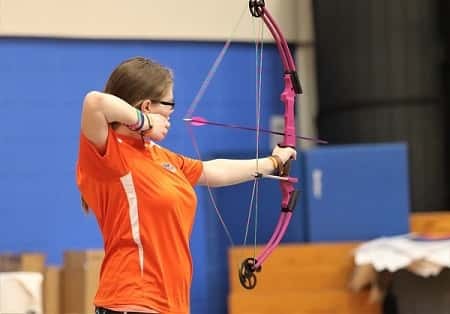 Sophomore Bella Barrett had the third best Marshall County score taking 4th in the girl’s division with 283 (15 tens). Senior Jacob Miller was 4th for Marshall County and 4th among 47 high school boys with a score of 281 (16 tens). Rounding out the top five for Marshall County, freshman Kye Babcock finished 5th in the girl’s division with 280 (12 tens). In 3D Challenge competition, Jacob Miller took first for Marshall County with 277 (19 tens) also earning the top spot in the boy’s division. Bella Barrett turned in the second best score for Marshall County with 277 (11 tens) and took 1st place in the girl’s division. Grace Boatright placed second overall in Bulls Eye for the Marshall County team with a score of 285 and 16 tens. North Marshall Middle took the top spot in the middle school division with a team score of 1657 (83 tens), led by Christian Jones with 292 (22 tens) good for a 2nd place overall finish among 54 in the boy’s division. Maci West had the second best score for North Marshall with 282 (14 tens) and a 2nd place overall finish among 52 in the girl’s division. In the 3D Challenge, Jones had the top score for NMMS with 288 (20 tens) good for 2nd among 29 boys and West also with the top girls score for NMMS with 278 (15 tens) for 2nd place overall among 23 girls. South Marshall Middle did not score as a team, but were led individually by Memphis Ford and Sarah Miller. Ford had the top score for South Marshall with 287 (19 tens) which placed him in 3rd place among the 54 in the boy’s division and Miller had the third best score for SMMS with 268 (10 tens), good for 6th place among 23 girls competing. In the 3D Challenge, Ford led SMMS with 266 (11 tens) for 5th place overall and Miller was second for SMMS with 266 (10 tens) and a 6th place overall in the girl’s division. Over the course of the season to this point, Jacob Miller has been solid for the high school team, taking the top position for the boys in all eight events. Several have led the way for the girls, including Kendra Cannon who has finished at the top for the girls five times this season, Bella Barrett with two top finishes and Zoey Ramsey with one. Christian Jones took first for North Marshall Middle in both the Bulls Eye and 3D Challenge. Jones began his first three round in Bulls Eye with three straight 50’s. North Marshall has consistently been led at each event by Christian Jones and Maci West. Jones has led the boys at all eight competitions and West has led the girls team seven times this season. North Marshall’s first place Saturday in both the events was their best finish of the season to date. Memphis Ford has led South Marshall in all eight events so far this season, Sarah Miller has taken the top spot for the girls five times and Addie Thomas has recorded three firsts. South Marshall has scored as a team in two events, the Graves County 3D Challenge and Marshall County 3D Challenge. 1/19 Graves New Yr. Tourn.